Respect: One word that goes a long way towards a safe and healthy workplace. Everyone deserves to work in an environment that is respectful and free of bullying, threats, and abuse. Bullying behaviours and threats of violence affect the overall health of an organization. 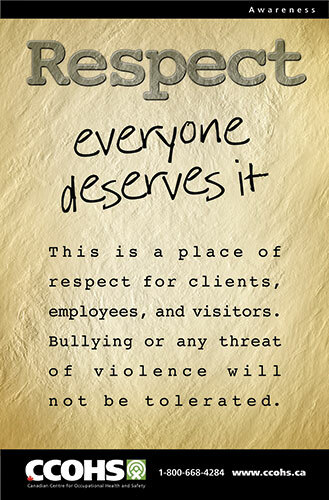 Display this poster where your employees are likely to interact with visitors, clients, and the public, as a reminder that respect is a two-way street. Everyone deserves to be treated with courtesy.